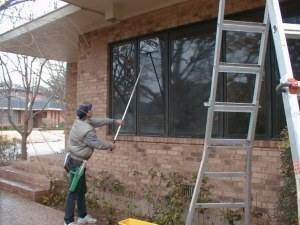 Gutter and window cleaning specialists. Handyman services Free estimates. What will it cost to have my Windows cleaned? An average Ranch Style 1,200 Square Foot home in Marshall can have clean windows inside and out for about $65! Same day service may be available! 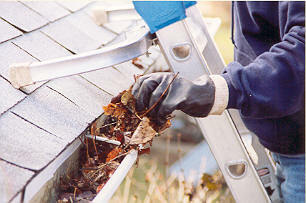 Gutter Cleaning... Gutters fill with leaves and other debris and become clogged if you have trees nearby. Just ask gutter installers. They'll tell you that you should clean your gutters twice a year, once in the spring after the trees bud out, and once in late fall after the leaves drop. That's a lot of trips up and down a ladder, and few of us are that disciplined. But clogged gutters overflow, soak the siding and cause paint to peel, dampen basements, erode foundations, splash against the building and rot wood, and wash out the petunias. Look for early signs of clogged gutters -- erosion in the flower bed or stain streaks on the gutter and fascia -- and clean the gutters before extensive damage occur. What will it cost to have your rain gutters cleaned? average cost is only $20! Call 2020 Clearview for a free estimate on your home. Same day service may be available in the Marshall area.